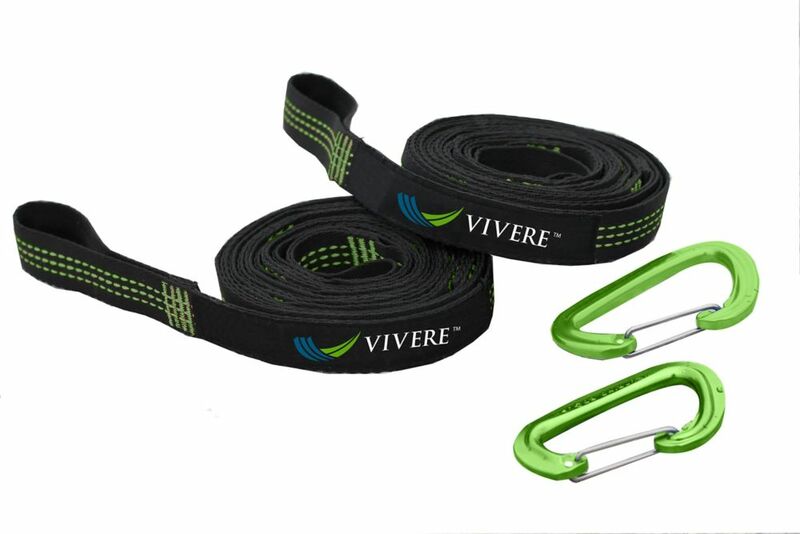 The Ultra-Lite Tree Straps from Vivere are a burst of colour and support for your hammock. Strong, brilliant green stitching outlines each loop, all the way down each 10 ft strap. Comes with 2 carabiners so that you can accomplish a quick set up with any hammock between two trees. These straps will wrap around any tree and help position your hammock to the perfect height. This hammock is the perfect place to drift away under blue skies and it offers lots of room for carefree summer fun. The large number of cords ensures optimal weight distribution and incredible comfort, as well as durability. The integrated safety swivel guarantees safe 360 rotation. Reinforced edges make the material extremely tear-resistant. Features: Hammock Chair Basic for 1 person. Basic size chair is perfect for small spaces. To prevent premature weathering, we recommend indoor storage for our products when not in active use. We do not warrantee against normal wear and tear. Fading and weathering due to prolonged exposure to sun, rain, snow and heavy humidity, is not covered by our warranty. We do not warranty against rot, mould, or mildew. We also do not warranty against product misuse or damage from improper storage, maintenance, installation, or modification. Wood hammock stand with hammock and canopy comfortably accommodates two adults. Give lazy days something to do. Hammock stand with hammock and canopy makes a great addition to your yard, patio, or wherever you want to hang out. The Art Deco design begins with the arched frame crafted of Larch hardwood which is valued for its tough, water resistant, and durable qualities a famous example of its longevity is its use in the construction of the ancient city of Venice. Relaxation surface and canopy are made of Textilene, a highly respected material that makes outdoor furniture last decades. The very pairing of natural elegance and soft, stable comfort separates you from the Joneses, but we believe you'll be so deeply relaxed that you wont notice their envy. Relax and unwind in this polyester rope hammock. Perfect for an afternoon siesta or time with a good book, this hammock also makes a great gift! The twisted polyester rope resists mildew, rot and decay. Spreader bars at each end keep the rope stretched out for partners to enjoy. Ultra Lite Hammock Tree Straps (2-Pack) The Ultra-Lite Tree Straps from Vivere are a burst of colour and support for your hammock. Strong, brilliant green stitching outlines each loop, all the way down each 10 ft strap. Comes with 2 carabiners so that you can accomplish a quick set up with any hammock between two trees. These straps will wrap around any tree and help position your hammock to the perfect height.